Few would consider Herbert Hoover a successful president; his name has become synonymous with the Great Depression. But knowing full well that much of history never makes it into your average history book, I decided to get a good biography and see for myself, especially since I’d recently finished reading about Woodrow Wilson and the two men were contemporaries. My selection was Hoover: An Extraordinary Life in Extraordinary Times by Kenneth Whyte. 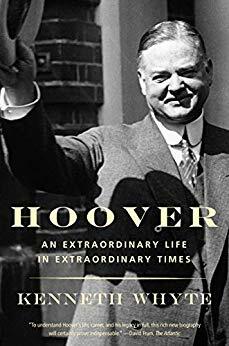 The first revelation was the book is well-named: Hoover was an extraordinary man. His early life was not easy. Born into a Quaker family, he almost died as a child and was orphaned at age nine. But he persevered, enrolling at Stanford University in 1891, that school’s initial year of operation. He eventually decided to major in geology. After graduation, he found work as a mining engineer, ultimately working for a British company in Australia and China, where he was caught up in the Boxer Rebellion. His business dealings made him a wealthy man; on the eve of World War I he was worth an estimated $4 million dollars (or about $100 million today). The Great War called him to public service. Caught in London, he helped organize the return of 120,000 stranded Americans at the request of the U.S. Consul General. His next job was feeding civilians in Belgium, which had been conquered by the Germans. It was a herculean task, at its peak, his American Relief Administration (ARA) was feeding 10.5 million people a day. When the U.S. entered the war, Hoover was tasked with running the U.S. Food Administration to support the war effort (“Food Will Win The War”). After the Armistice, he went back to feeding refugees in Europe; he tried to reach everyone who needed aid regardless of politics. This public work made him a national figure, and he was appointed Secretary of Commerce by President Harding; he continued in that capacity after Harding’s death for President Coolidge. His energy and ideas (he was a big proponent of standardization throughout the country, a radical idea at the time) made him a dominant cabinet member. In 1928, Hoover’s record of service made him a logical choice for the Republication presidential nomination, despite never having been elected to anything since college. (There was some talk that his extended time outside the country made him ineligible for the presidency.) Nevertheless, he became the 31st president with 444 electoral votes to Democrat Al Smith’s 87. The future seemed so bright. Then came the stock market crash of 1929. 1. Since Hoover had never run for office before, his political skills were very limited. 2. The Great Depression was a worldwide phenomenon, and much was beyond his control. 3. Economic downturns did happen semi-regularly; at that time they were called panics (to see what I mean, get a good history book and look in the index under ‘P’). They were frightening and painful, but the private sector always pulled the country up. Conventional wisdom was the government ‘s first priority was to keep its own house in order, starting with a balanced budget. 4. There were increases in government spending for infrastructure, but the Federal Government was so small these programs had little overall effect. 5. Information-gathering was primitive at the time, and no one know exactly what the real situation was. 6. There was a series of economic upticks that gave the impression of improvement, but unfortunately they were all false starts. 7. There was a rise in partisan politics. In past years, national political parties basically shut down between presidential elections. This time the Democrats didn’t, and Hoover was subjected to almost constant criticism throughout his term. 8. The Democrats made substantial gains in Congress in the election of 1930. Republicans had a one-seat majority in the House (then lost control after two special elections), and the Senate was tied. Consequently, Hoover’s maneuvering room was seriously curtailed. During the presidential campaign of 1932, Hoover was vulnerable, but in the context of the times, he thought it undignified to actively campaign initially. Not that it would’ve done that much good; he only received 59 electoral votes to Roosevelt’s 472. The interregnum between the election and Roosevelt’s inauguration was a particularly delicate time. Recall in those days the new president didn’t take office until March 4th, and a series of bank failures erupted during this period. Banks had failed before, but this time it was more widespread. Hoover asked Roosevelt to help him restore confidence, but Roosevelt refused, preferring to let Hoover shoulder the entire blame. Republicans thought the crisis could have been mitigated, perhaps even avoided, if the two had worked together. Similarly, Hoover claimed some of Roosevelt’s New Deal ideas were actually his. Herbert Hoover did not retire quietly. Longing for another chance as president after having left office at a comparatively young 58, he was a critic of the New Deal, but his name was toxic. He continued his criticism until the Japanese attack on Pearl Harbor, believing Roosevelt had provoked the Japanese and aiding the Soviet Union was a mistake. But his reputation was ultimately rehabilitated after he headed two commissions on government efficiency, one for President Truman in 1947 and a second for President Eisenhower in 1953. Both were well received. He also authored many books and articles during this time. Herbert Hoover died on October 20, 1964 at age 90. He really did lead an extraordinary life. His humanitarian work alone saved many from starvation. But as president, he simply had the misfortune of seeing the world economy collapse around him.